Last Saturday (24-11-2012), our company Hai-O Marketing Sdn Bhd celebrated their 20th Anniversary and also 2012 CDMs Celebration at Stadium Melawati Shah Alam. 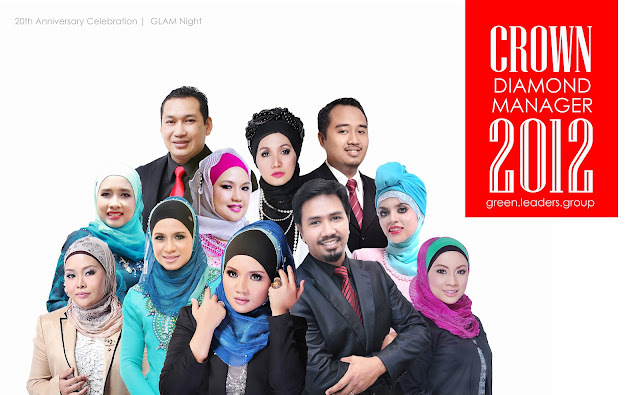 Out of 35 2012 CDMs in Malaysia, 7 are from Green Leaders Group.. We really conquer the stage during the event. One of them is my CDM Naa Kamaruddin..
Below are several of pictures during the event. The stage that I think is at par with other prestige award ceremony like AIM, ABPBH & ect.. Us looking all GLAMmed up for the event.. Me with bakal DSM Nadhyra Sidek & bakal DDM Juju..
With my one and only CDM Naa Kamaruddin.. She's wearing Datuk Radzuan Radzwill's designer dress.. Adored her so much.. Congratulations dear for the great success.. Hopefully one day I will be able to achieve what you have achieved today.. Will follow your every step..
Part of the Green Leaders Council getting ready for our group photo shoot.. Look at their designer dresses.. From left to right: CDM Adibah Karimah, CDM Hanis Haizi (also wearing Datuk Radzuan Radzwill's), CDM Razali Zain, CDM Syukran, CDM Maisarah Ibrahim, CDM Sha Khalid, DDM Zahir & CDM Salha Zain..
Stay tune for more stories and pictures on the event..